The Certified Signing Specialist Standards announced last week by the Signing Professionals Workgroup have generated considerable discussion, and one of the more talked-about components is the annual background screening. The background screenings must also be scored using the Standard’s point system that assigns a value to specific offenses for calculating a pass/fail result. If your background screening does not include all of these elements, it may not be acceptable to a lender or title company that has adopted the Standards. You may therefore be asked to obtain a background screening from a vendor whose screening meets the standards. A handful of states currently have a background screening requirement for Notary applicants, but these fall short for use by lenders and title companies because the qualification standards to serve as a Notary are not as demanding as those to work in the real estate finance industry. Notary application requirements generally exclude only those with felony convictions, but lenders and title companies are concerned about misdemeanor offenses, as well, such as financial crimes and assault. Further, state-required background checks are only run when you apply for or renew your commission. 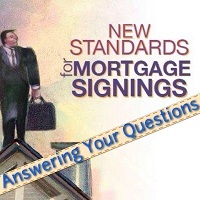 In opting for an annual screening, the Signing Professionals Workgroup noted that Signing Specialists routinely handle documents containing sensitive consumer financial information and are invited into borrowers’ homes. Going forward, the SPW will be approving multiple vendors to provide certification and background screening for Notaries. Each lender and title company can choose whatever background screening vendor(s) it wants to work with. Their freedom to choose means that some lenders may only accept background screenings from certain vendors, or they may accept a background check from any vendor that meets all of the searches as recommended by the Standards. For more information about the Certified Signing Specialist Standards, visit NationalNotary.org/Standards or email standards@nationalnotary.org. For questions regarding your specific situation or account, emailstandards@nationalnotary.org or call toll free 855-762-5415.